Article first published as TV Review: JESSICA JONES Season 2 on Seat42F. Marvel’s JESSICA JONES is finally back for a second season on Netflix! The more-than-two-year wait between seasons can be explained by the aggressive Marvel Netflix production schedule, which saw four additional shows premiere since then, including a team-up between Jessica and other heroes, and a second season of an older series, Daredevil. With crossovers between the casts, it would be difficult to shoot them all at once. Though given how quickly the shows are being released now, I wouldn’t expect such a long break the next time. Back to the series at hand, JESSICA JONES seems not to have missed a step as it begins season two. Jessica (Krysten Ritter) is haunted by the fact that she killed Kilgrave, making her, in her mind, a killer. To cope, she’s drinking a LOT, even for her, and refusing cases she might develop an emotional attachment to. Her sister, Trish (Rachael Taylor), has taken the opposite tact, jumping fully into investigating the past, though admittedly Trish didn’t murder anyone. And Malcolm (Eka Darville) tries to build up Alias Investigations as a business, despite its salty owner. Even Simpson (Wil Traval) pops up to show us how he’s doing after the events of last season. It seems like not as much time has passed in the world of JESSICA JONES as it has in the real world, but that’s OK. Some time has gone by, and big events stick with you for weeks, months, even years. So it makes total sense that the emotional state of many of the players is influenced by season one, even if it’s been a bit. Speaking of emotions, despite her estrangement from Jessica, Jeri Hogarth (Carrie-Anne Moss) remains very much a part of the series. Her scenes are separate as she deals with some very tough medical news in not-so-healthy ways. But I’m interested to see where she will tie into the central story. Season two doesn’t have such a clear villain to focus on as Kilgrave was. Instead, there’s a shady company known as IGH that seems to serve as the antagonist. But it doesn’t come out of nowhere. These are the people that gave Jessica, and others, powers. There’s a twenty-day span spent in their care that Jessica doesn’t remember. Why did they release her? What was their purpose? Jessica doesn’t know and so we don’t, though it seems certain we will find out as time goes on, especially with Trish on the case. It isn’t necessarily a novel idea to dig into a lead character’s past to mine drama. But given how detached Jessica is in her daily life, it feels like a good road to go down for her. 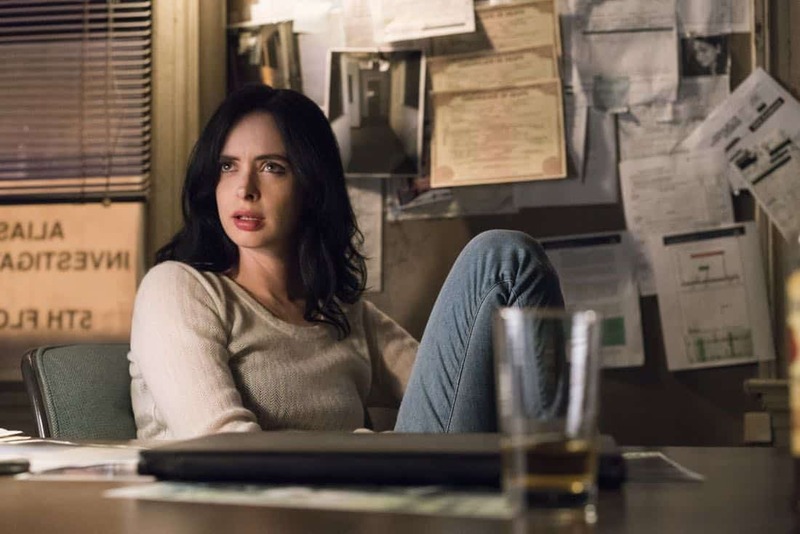 She isn’t going to speak her feelings to anyone, nor the audience, so by placing her in a position where she’s forced to confront her internal struggles, JESSICA JONES lets us learn a lot about the character. Physical artifacts force their journey along to nice effect. It’s far more interesting than just seeing her fight some baddie. JESSICA JONES is the story of more than one broken character, but each have their own unique story. While they cross many times, there’s also a feeling of aloneness more present than with some of the ensemble casts of other series, even other Marvel Netflix series. This alone-while-with-someone take is something many viewers can relate to. Seeing Jessica, Trish, Malcolm, and Jeri deal with it also inspires us in a way heroes don’t usually do. JESSICA JONES shows us a different kind of inspiration, and it’s welcome. Given the complex story and the deep emotional content, even though I’ve only viewed two hours thus far, it seems certain JESSICA JONES will maintain its quality through a second run. Even if it’s hard not to miss the magnetic persona of Kilgrave, whose specter hangs over the story. JESSICA JONES season two is available now on Netflix.